I Am The Flag by Ruth Apperson Rous: Poetry. I was born on June 14, 1777, in Philadelphia. 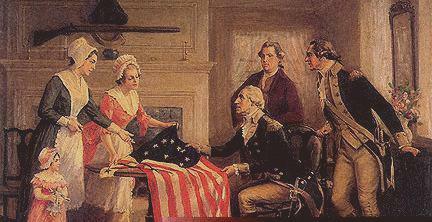 There the Continental Congress adopted my stars and stripes as the national flag. My thirteen stripes alternating red and white, with a union of thirteen white stars in a field of blue, represented a new constellation, a new nation dedicated to the personal and religious liberty of mankind. Today fifty stars signal from my union, one for each of the fifty sovereign states in the greatest constitutional republic the world has ever known. My colors symbolize the patriotic ideals and spiritual qualities of the citizens of my country. My red stripes proclaim the fearless courage and integrity of American men and boys and the self-sacrifice and devotion of American mothers and daughters. My white stripes stand for liberty and equality for all. My blue is the blue of heaven, loyalty, and faith. I represent these eternal principles: liberty, justice, and humanity. I embody American freedom: freedom of speech, religion, assembly, the press, and the sanctity of the home. I typify that indomitable spirit of determination brought to my land by Christopher Columbus and by all my forefathers - the Pilgrims, Puritans, settlers at Jamestown and Plymouth. I am as old as my nation. I am a living symbol of my nation's law: the Constitution of the United States and the Bill of Rights. I voice Abraham Lincoln's philosophy: "A government of the people, by the people,for the people." I stand guard over my nation's schools, the seedbed of good citizenship and true patriotism. I am displayed in every schoolroom throughout my nation; every schoolyard has a flag pole for my display. Daily thousands upon thousands of boys and girls pledge their allegiance to me and my country. I have my own law—Public Law 829, "The Flag Code" - which definitely states my correct use and display for all occasions and situations. I have my special day, Flag Day. June 14th is set aside to honor my birth. Americans, I am the sacred emblem of your country. I symbolize your birthright, your heritage of liberty purchased with blood and sorrow. I am your title deed of freedom, which is yours to enjoy and hold in trust for posterity. If you fail to keep this sacred trust inviolate, if I am nullified and destroyed, you and your children will become slaves to dictators and despots. Eternal vigilance is your price of freedom. As you see me silhouetted against the peaceful skies of my country, remind yourself that I am the flag of your country, that I stand for what you are - no more, no less. Guard me well, lest your freedom perish from the earth. Dedicate your lives to those principles for which I stand: "One nation under God, indivisible, with liberty and justice for all." I was created in freedom. I made my first appearance in a battle for human liberty. God grant that I may spend eternity in my "land of the free and the home of the brave" and that I shall ever be known as "Old Glory," the flag of the United States of America.